Legend has it that over several centuries, only one person has ever won The Ghostly Bake Off Crown. Little is known about her original, only that she was believed brutally murdered with a mixing utensil many worlds ago, returning in people’s dreams to avenge those who wronged her. In her busy schedule of haunting the living, the Witch of Gibraltar loves nothing more than greasing up some baking trays. All Hallow’s Eve is her favourite time of year, and with this she has cracked out an absolute screamer of a recipe! She may be dead, but she still appreciates great macros. 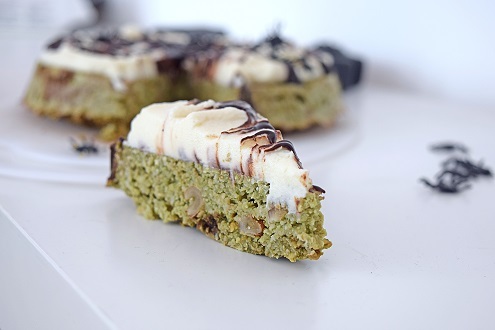 Feast your eyes on this Halloween Matcha Cake recipe, containing a whopping 9.6g protein per slice….. But if you find yourself standing alone this Halloween, in a dark and lonely kitchen, be careful what you do……for no matter how tight you close your eyes, the Witch of Gibraltar will surely come for you! Happy Halloween! 1.) Preheat oven to approx. 160-170 Degrees C. 2.) Mix all the cake ingredients in a bowl until everything is blended together. Pour into a round silicone mold (or cake pan) and bake for 20 minutes until baked through but soft/ springy to touch. 3.) Remove from oven and leave to cool while preparing topping. 4.) For topping, mix yoghurt and casein to achieve a thick cream-like consistency and once cake is completely cooled, spread evenly over the top. 5.) To make the spider web shape, grab your Choc Shot and first make 2 lines, the shape of a cross. Then begin making lines across within the spaces until you end up with a star shape. With a sharp knife then begin joining them like seen in picture, ending up in a spider web.